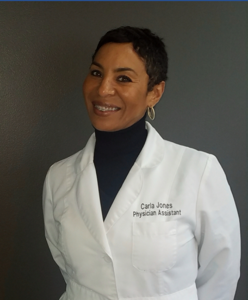 Carla Jones, PA, has over twenty years of experience as a Physician Assistant and women’s health specialist. She is the director and lead trainer for women’s health at the Doctor’s Anti-Aging Institute. She is well experienced and is dedicated and passionate about her career and patients. Jones prioritizes her patient’s comfort and works hard so her patients can be confident in her. She is warm hearted and kind, making her easy to talk to and confident. She offers a unique philosophy of compassionate care to create a comforting experience and helping patients boost their confidence by enhancing their lives, appearance and happiness.